Netflix Inc. Hits a New All-Time High: Is It Worth $56 Billion? Netflix is now worth as much as media giant Time Warner. 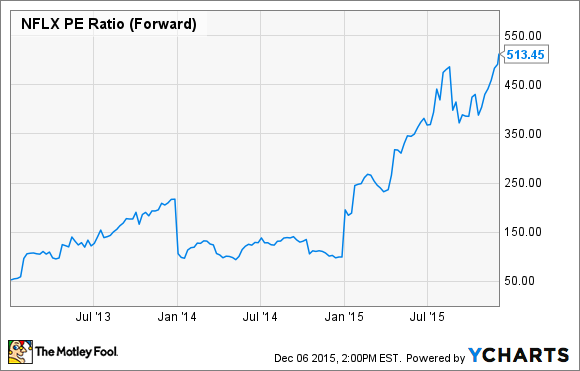 Shares of streaming video pioneer Netflix (NASDAQ:NFLX) have had another outstanding year in 2015. The stock hit a new all-time high of $132.20 last week. As Netflix stock has taken off, the company's market cap has surged from around $20 billion in January to a staggering $56 billion today. NFLX Market Cap, data by YCharts. 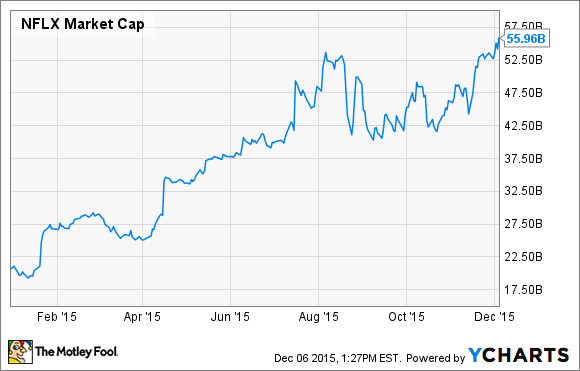 Netflix's market cap is already on par with those of some of the biggest media giants. Indeed, Time Warner (NYSE:TWX.DL) -- owner of top premium cable network HBO, other popular cable channels like TBS, TNT, and CNN, and one of the major Hollywood studios (Warner Brothers) -- also has a $56 billion market cap. Is Netflix really worth as much as Time Warner? For most of its existence, Netflix has had an extremely high valuation by conventional standards. Today, Netflix has an extremely high valuation even by its own standards. It currently trades for about 500 times forward earnings, up from roughly 50 times forward earnings in early 2013. NFLX Forward P/E Ratio, data by YCharts. To many investors, that stratospheric earnings multiple in itself is reason to avoid -- or even short -- Netflix stock. However, Netflix's profitability is currently being held back by its heavy investments in new international markets. This sets it up for a big jump in earnings over the next few years. Through the first three quarters of 2015, Netflix had a $225 million contribution loss in its international markets. It projected that its international contribution loss will be about $117 million in Q4, for an annual total of $342 million. If Netflix shut down all of its international operations tomorrow, the savings would boost its annual EPS by $0.50 or more. That would roughly triple its EPS, bringing its earnings multiple below 200. The fact that Netflix continues to invest hundreds of millions of dollars in international markets each year shows that it expects a big payoff there in the future. Netflix also recently increased the price of its most popular streaming plan for new customers in the U.S. and several international markets. The new U.S. price is $9.99/month, up from $7.99/month as recently as early 2014. Netflix recently implemented another U.S. price increase. Photo: The Motley Fool. Long-time U.S. Netflix subscribers have been grandfathered into the original $7.99/month price. That "grandfather clause" expires next spring, though. The result is that tens of millions of subscribers will suddenly start paying an extra $2/month, bringing in more than $500 million of incremental annual revenue. That would provide another huge earnings boost. As valuable as Time Warner? Even though Netflix has an opportunity to dramatically boost its earnings in the next few years by reducing its international losses and raising its average revenue per user, it's hard to justify giving it the same valuation as Time Warner. Time Warner has more than $28 billion in annual revenue and is already highly profitable, with a 26% operating margin. By contrast, Netflix's expected revenue this year is just $6.8 billion, so it would need to more than quadruple in size just to get to where Time Warner is today. And while a 26% operating margin may be feasible one day for Netflix, that day is many years in the future. Furthermore, Time Warner owns lots of valuable intellectual property. This includes its massive library of award-winning HBO content, popular film franchises based on DC Comics characters like Batman and Superman, and the film rights to Harry Potter. These assets give Time Warner a wide moat. To be sure, Netflix has its own immense competitive advantages: global scale and a first-mover position in the video streaming world. Over the next decade, I expect Netflix to maintain its dominance in streaming video and come into its own as a highly profitable media giant. However, it could take Netflix that much time just to reach Time Warner's current size. In the meantime, Time Warner will probably produce billions of dollars of free cash flow each year, returning most or all of it to investors. Time Warner is also still growing. As a result, it looks like a much more desirable investment than Netflix at this point.